So according to the ‘Travels of Adam’, you should eat a tub of Nutella in one sitting before you turn 25. Obviously this isn’t something we’d advise doing on a regular basis as it may end up in you becoming 25 stone when you’re 25. But here we go, this is me eating a tub of Nutella in one sitting. Enjoy. Which countries are suffering from a quarter-life crisis? Following on from our earlier post on how it is not just Britain that is suffering from a quarter-life crisis due to poor levels of youth employment. We thought we would ask our good friend Google which countries are suffering from a QLC the most. The results are quite surprising. According to Google Trends there is in fact a number of other countries who are suffering from QLCs. However, what is surprising is that the country who searched for quarter-life crisis the most was not in fact the US or the UK – it was the Philippines. As you can see from the graph below, the Philippines have been using the search term ‘Quarter Life Crisis’ three times more than those in second place, the US. With Makati City being the place in crisis the most, closely followed by Quezon City and Manila. Youth unemployment has been rife in the Philippines, specifically over the years of 2009 – 2012 where unemployment among people aged under 30 averaged 74.825 million people over the four years, a rate of 12.65% – that’s a rate of one in eight people under the age of 30 being unemployed. 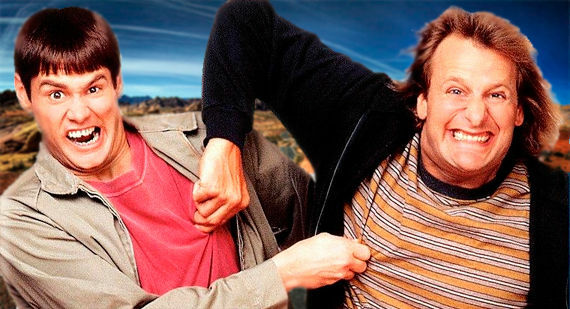 Is it just Britain having a Quarter-Life Crisis? Youth unemployment has been rife in the UK over the last few years, and in Quarter Life Clueless’s opinion is one of the biggest factors as to why quarter-life crisis is such a hot topic at the moment. 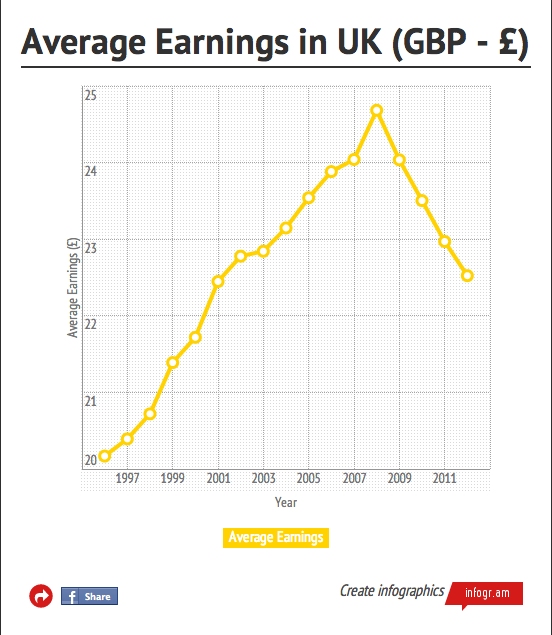 However it is fair to say that it’s not just young Brits who are struggling in the job market. Data collated from Eurostat shows that Britain’s youth unemployment rates are in fact no where near as high as those in countries such as France, Spain, Portugal and Italy (no prizes go to those who guessed Greece’s youth were worse off than ours, at least that’s something ‘ey?). What this all shows is that despite things being pretty grim at the moment in old Blighty, things are a lot worse on the other side of the channel. A discovery that will perhaps be met with cries of Sacre Bleu by our rather less fortunate French counterparts. Are you really suffering a Quarter-Life Crisis? 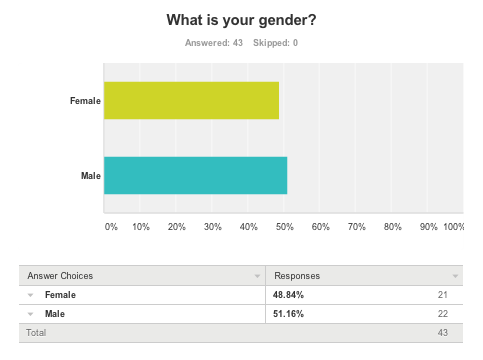 In order to understand whether people are really suffering from QLCs we decided to launch our own poll via SurveyMonkey. The topic of QLC has been popping up all over the place these last few weeks. As mentioned in our earlier post it’s showing up everywhere. From the Guardian to Buzzfeed, everyone is going on about it. But it’s all well and good reading about it, but the big question is – are people really suffering from it? 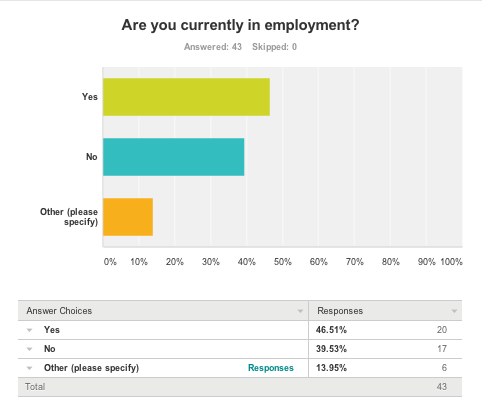 In a quest to find out, we conducted a QLC related poll. 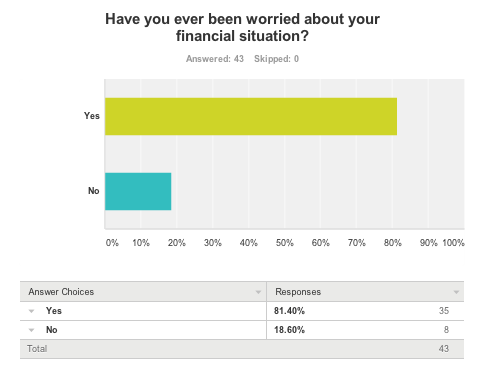 Out of our 43 respondents we discovered some rather interesting things, such as the fact that over 80% of respondents have had financial worries at some point over their life. Whilst financial worries are only a minor component in what can cause someone to have a QLC our statistics show some interesting finds, but rather than going on about it how about we let you look at it yourself? 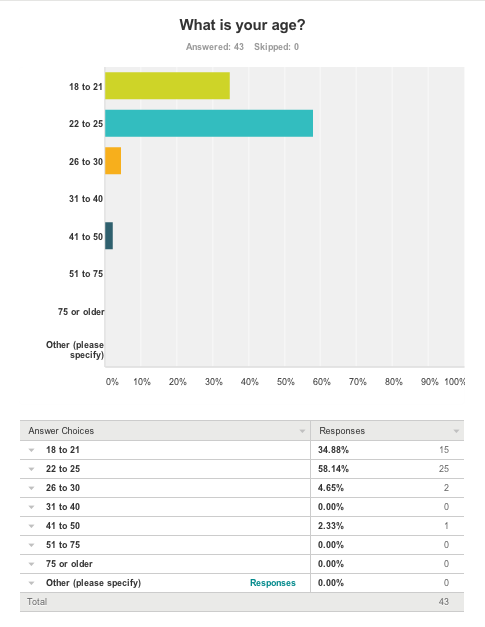 As you can see, most of our respondents fall into the age group that encompasses QLC (18-30), with one anomaly. 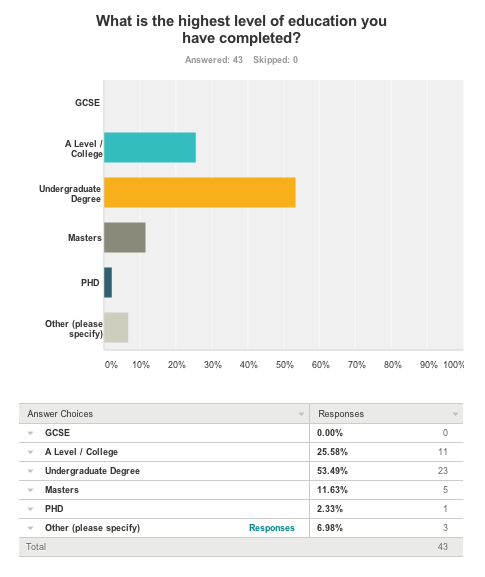 Most of our respondents have been to University (over 70%). 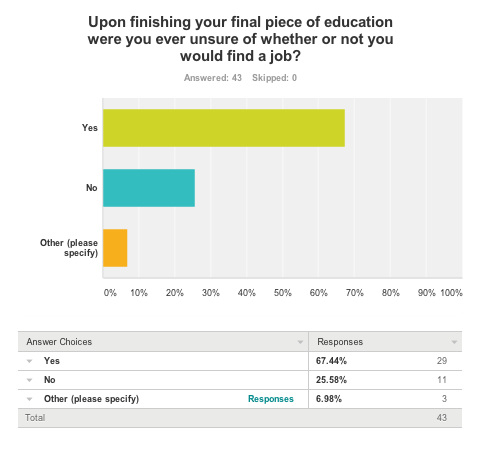 With two thirds of respondents saying that they have been worried about finding a job after finishing education. 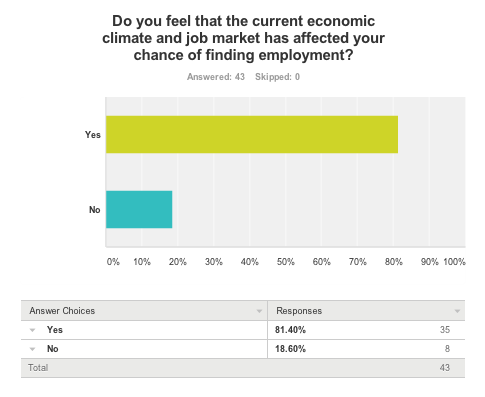 Over 80% of respondents feel the struggling UK economy is playing a part in their struggle to find employment. 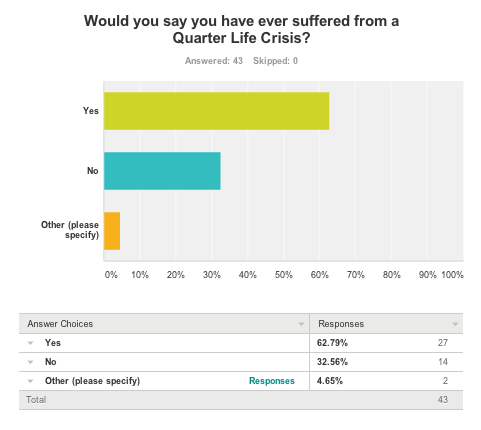 A surprising number of respondents claim to have suffered from a QLC at some point in their life, with one respondent who chose ‘Other’ stating ‘I am having a crisis, but I don’t want to put a label on it such as Quarter Life Crisis’. Whilst our survey was taken by a small number of people it does show that QLC is a real thing affecting real people, and that it isn’t just media hysteria or a new term coined by psychiatrists to allow people to feel a bit better about themselves. 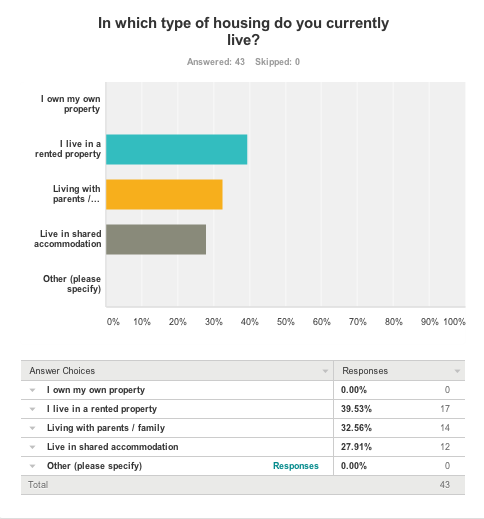 We’ve also discovered that three main problems arise during young people’s lives – trying to become financially self sufficient, trying to find suitable housing and trying to find a job after finishing education. We can also take away from our survey that regardless of your education level people will suffer from a crisis in one form or another. So the best thing to do is just keep going and hope that things will turn out alright in the end as unfortunately there’s not a great deal else you can do. Especially in a time of austerity and a shrinking job market. So good luck guys, and keep safe. Mike Nichols’ classic film ‘The Graduate’ was on ITV3 yesterday, and after our last post mentioning it, we thought you guys would be watching it. The film is regarded as one of the first on screen depictions of QLCs and shows the main character Benjamin Braddock (Dustin Hoffman) struggling to understand what he should do with himself after graduating university. So rather than considering doing a post-graduate degree or learning a new skill, Ben decides the best thing to do in a time of austerity and a struggling job market is to sleep with Mrs. Robinson. Queue drama. 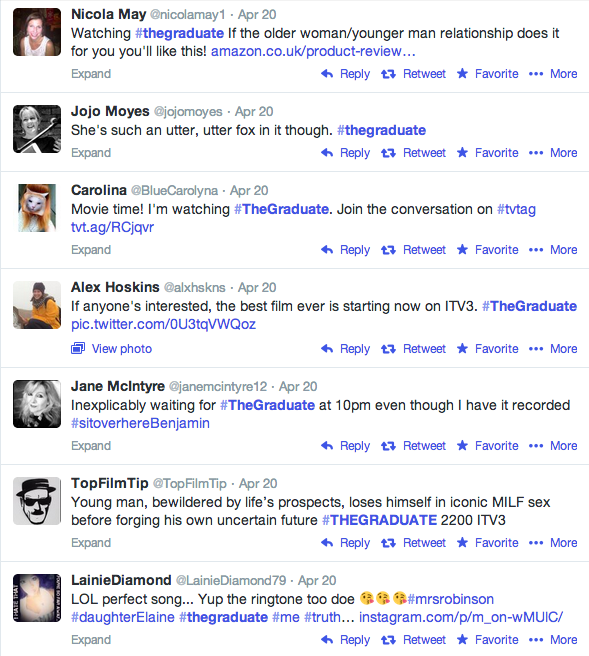 Here is what some of our friends on Twitter were saying about The Graduate. As you can see, it was pretty popular and one of the lovely tweeters points out that Mrs. Robinson is quite the foxy lady. So as you can see, we weren’t the only ones slightly confused by how The Graduate can help guide you through your QLC as it seems that the only life tips we can take away is that sleeping with older women doesn’t make you happier or any more employable. However, we thoroughly enjoyed watching it and we’d recommend you do the same. Can dating apps help cure a Quarter-Life Crisis? 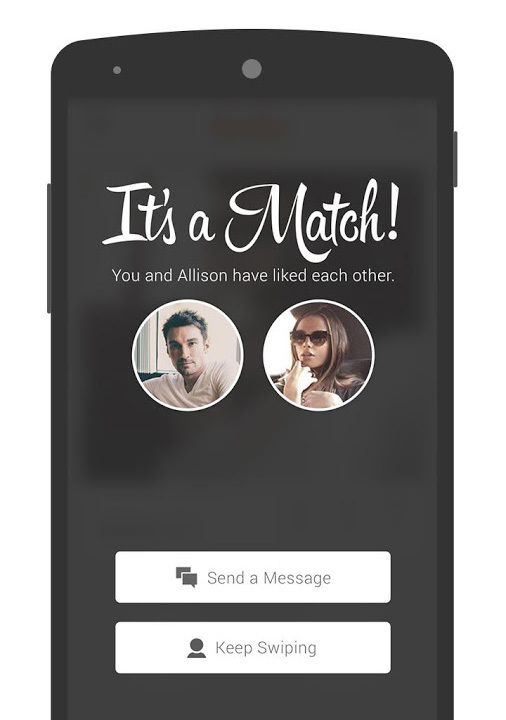 In our latest podcast we discuss whether dating apps, such as Tinder, can help make QLCs that little bit easier. In an attempt to wade through the world of Plenty of Fish, Tinder and OkCupid! we speak to Eve Simmons of Apphrodite – a new and exciting blog exploring the realms of dating apps. In the podcast we discuss whether dating apps really are helping people, why they’re using them and what you can do to avoid being the perpetually single one amongst your friends. Have a listen and we hope you enjoy our pearls of wisdom. 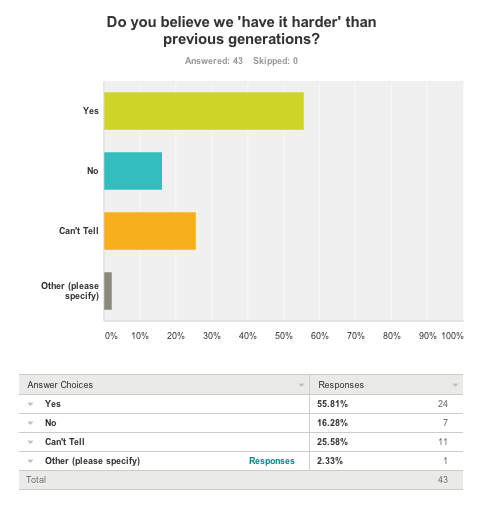 Is life harder now than it was for other generations? A big theory on why so many of us are going through a Quarter Life Crisis is because of the tough financial times of the modern era. 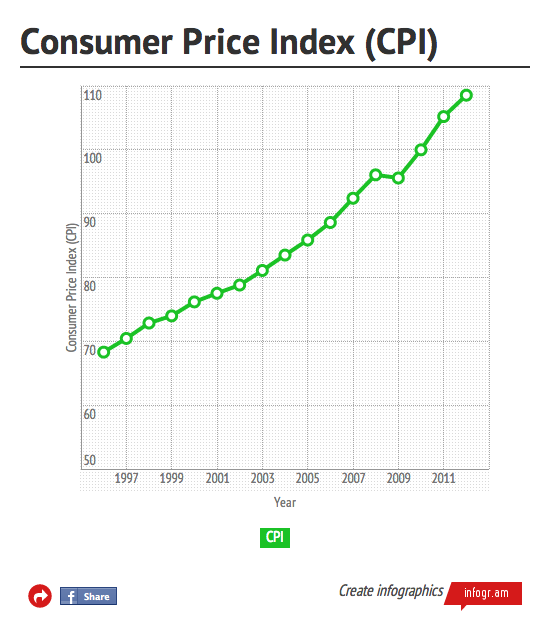 Over the last 16 years the average household income has increase 11.7% (from £20,169 to £22,524), whilst the Consumer Price Index (CPI – a figure which measures the relative price of consumer goods and services purchased by normal households) has increased 58.9% over the same period of time. This shows the way in which the average standard of living has fallen significantly over the last 16 years, and could possibly be a major reason why so many of us are struggling to cope with the trials and tribulations of modern day life. All figures have been taken from the ONS. AUDIO: Interview with Dr Oliver Robinson: Is the quarter-life crisis worse for women? Infographic: What do American 18-29 year-olds think is most important?